This article was originally published in the Fall 2015 issue of Life at Wheaton Bible Church, Wheaton Bible Church’s print magazine. For fourteen young teens, March 19, 2015, was the day they made the decision that changed everything. Presented with the truth of the Gospel and challenged with the reality that following Jesus is an “all or nothing” proposition, these young men and women committed themselves to the cause of Christ and became members of the family of God. 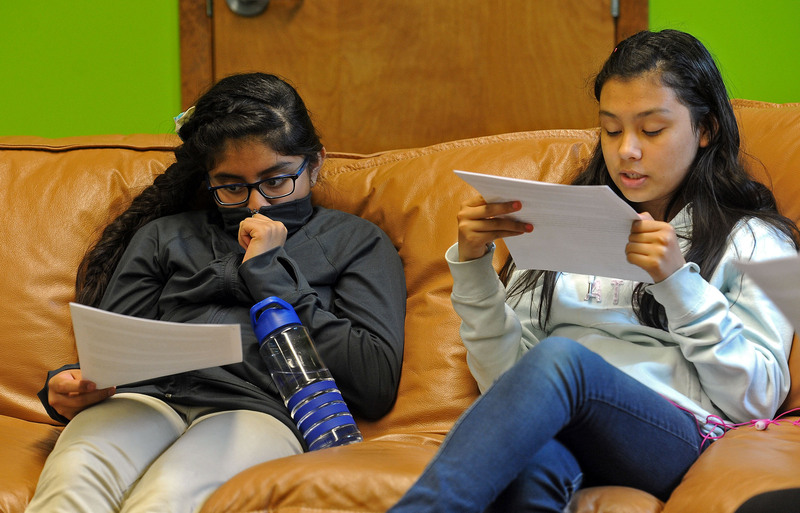 Until they joined Puente del Futuro—Puente del Pueblo’s after-school tutoring and enrichment program for middle school students who live in the Timber Lake and Main Park Apartments in West Chicago—few of these sixth-, seventh-, and eighth-grade students knew much of anything about Jesus. 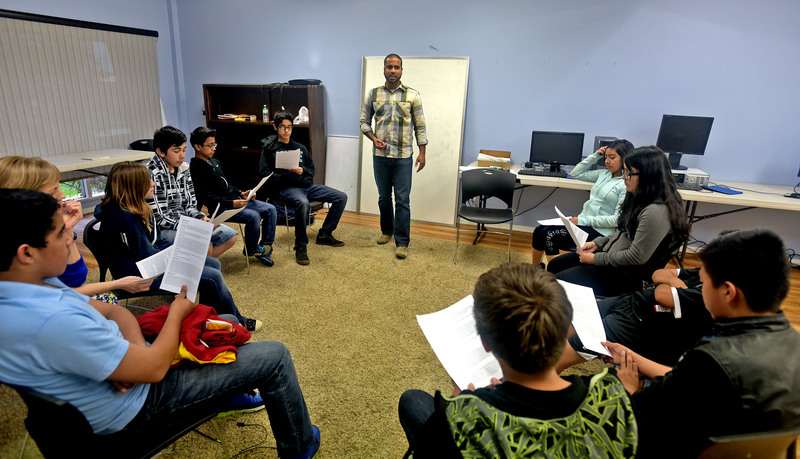 But with their parents’ permission, they became part of Puente’s optional one-hour Christian education class. Since last fall, eight to twelve students at the Main Park site and ten to fifteen at Timber Lake have gathered each Thursday afternoon with Iglesia del Pueblo Youth Pastor Wil Franco. Over the years, as Wil worked with the kids at Puente, he realized that although the students listened politely during the Christian education time, they weren’t really “with him” when he talked, no matter how much he prepared or how polished his lessons were. 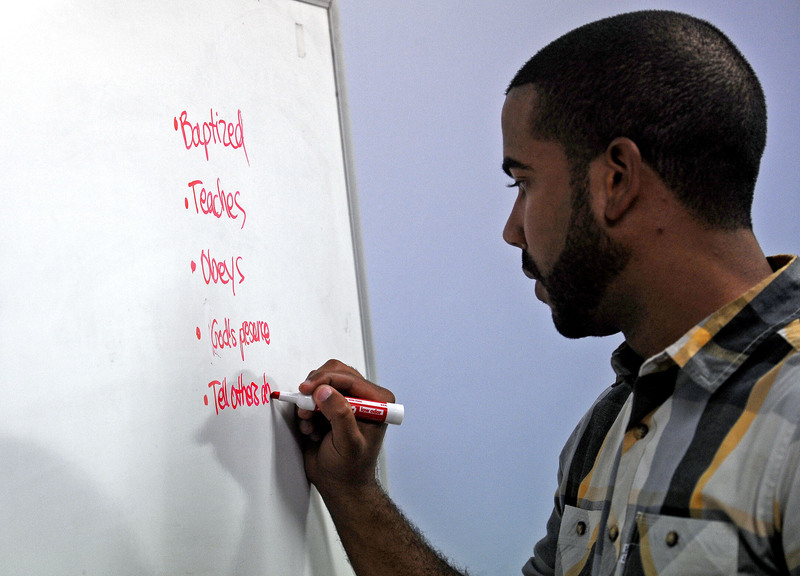 Last fall he tried a new, more interactive approach—and quickly learned that engaging the students in conversation was far more effective than doing all the talking himself. So since the beginning of the academic year, their weekly time together has begun with reading the verses they will be studying together and then talking about what they have read. Since most of the students don’t have a Bible, Wil hands each one a sheet of paper with that week’s verses printed out. Then they go around the circle, each student reading a verse. For a lot of the kids, reading the Bible together was a totally new experience. Another significant change occurred when Wil made the decision to go deep into the subject of discipleship. 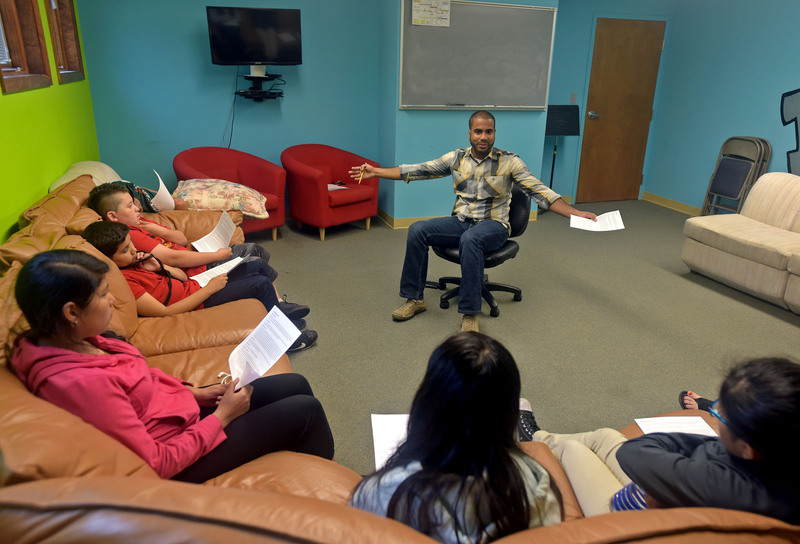 Over the previous months, he had led Bible lessons on practical subjects like the importance of words, godly habits, personal responsibility, relationships, and other topics relevant to middle school students. “But then,” Wil said, “God laid it on my heart to teach them what it means when Jesus says He wants all your life or none of it. What does it look like when someone becomes a disciple of Jesus—and how does that change how that person behaves at home and at school and on the bus in the morning? As Wil introduced the students to what it means to be a disciple, he had a strong sense that God was preparing to do something significant among those kids. In fact, since the school year began, Wil had been asking a number of his coworkers to pray with him for the middle schoolers he was meeting with in the Puente program. The students listened intently as Wil spoke. For some, this was brand-new information. Others had never before fully understood. As the lesson came to a close, Wil asked the students to bow their heads. “‘I feel that some of you have never heard this about Jesus before or have never heard what it means to be His disciple. If this is you today—if you don’t know who Jesus is and you are tired of trying to fix yourself, and you want to follow Him and you want Him to come into your heart and life—I want you to raise your hand. “Seven of the eight kids in the room raised their hands,” Wil remembers. “Their eyes were still closed, and even then I wanted to be sure they understood. I think my prayer time was longer than our teaching time that day,” Wil says with a smile, “because I wanted to be really sure they understood. “I told them that if they had raised their hand, I wanted them to stay back when the others went downstairs for game time so I could pray for them. Soon it was time for Wil to head to his next regular Thursday appointment, to meet with the students at Puente del Pueblo’s Timber Lake site. As he drove, he prayed that these middle school students, too, would hear and respond to the message of the Gospel. Again the group was smaller than usual. Wil laid out the challenge and the invitation. He explained—and explained again—to be sure the students understood the step they were taking and what it means to become a disciple of Jesus. This time he saw a nearly identical response: seven more middle school students were born into God’s family that afternoon. Knowing he would have the opportunity to meet with these students throughout the rest of the school year, and recognizing the importance of creating an ongoing follow-up plan for these young new believers, Wil went to work right away on an idea he had to create a Bible study plan for them based on the Gospel of Mark. As Wil prayed about how to equip this new group of believers, he came up with the idea of creating some little booklets that would provide a daily time of Bible reading and application geared specifically to their needs as brand-new believers. “I wanted them to have something right away, so I just did the first two weeks—covering the first three chapters of Mark—to get them started. By the end of those two weeks, I had the rest of Mark done,” Wil says. “These daily devotionals go passage by passage through Mark, with verses for each day and five basic questions on the passage in front of them,” he said. The devotionals also included background information where it was needed, to help the students understand the context of the passage. One note, for example, answered the question What is leprosy? And at the end of each day’s lesson, Wil added a suggestion about what to pray for and how to pray. Some of the students are working through the devotionals at home; others choose to read the lesson and work through the questions during the Puente after-school program. The booklets have also allowed the other Puente del Pueblo leaders—who see these kids almost every day—to be part of the disciple-making process. Several of the adult staff and volunteers have committed to reading and studying those same daily lessons, and as a result they’ve been able to answer the kids’ questions about what they are learning. After the students finish Mark, the next lessons will take them through 1 and 2 Timothy. Many of the students are also able to attend the Iglesia del Pueblo youth group on Friday evenings, thanks to a bus Puente has been able to provide that picks up students at both Timber Lake and Main Park Apartments. Wil hopes to see more and more of the Puente students fully integrated into the Iglesia del Pueblo congregation, eventually attending on Sunday morning as well as Friday evening. The students who professed their commitment to follow Jesus that March afternoon face some significant challenges. Few, if any, receive spiritual encouragement at home, and sometimes they need to be reminded that being a disciple means a whole new way of living and interacting with their peers. But Wil has no doubt that their commitments were real.